This quarter, the growth of open access has been dramatic in open access journals, open access archives, and, perhaps most noteworthy, open access policies. The Directory of Open Access Journals (DOAJ) is on the verge of an important milestone - 4,000 fully open access, peer-reviewed journals, double the number of the largest commercial publisher. DOAJ is growing at the rate of 2 titles per day. OpenDOAR lists 1,373 repositories, an increase of about 70 this quarter. Scientific Commons now encompasses 26 million items, an increase of 2 million. 663 journals are now voluntarily participating in PubMedCentral, an increase of 119 (22%) this quarter. 447 journals provide immediate free access through PubMedCentral, an increase of 29 (7%) this quarter. There are 11 more open access policies, for a total of 72 policies worldwide, and 4 more proposed policies, for a total of 14 proposed policies. One decrease is noted - not in open access per se, but rather subscription journals providing free back issues: Highwire Press seems to have 212,000 fewer free articles, a decrease of 10%. This is a bit puzzling, as Highwire has added 1 more completely free site, and there is an increase of 11 sites providing free back access. Any background on what is happening here would be most appreciated. 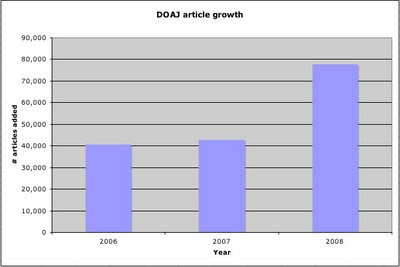 Recently, I posted the DOAJ Growth Rate 2005-2008. 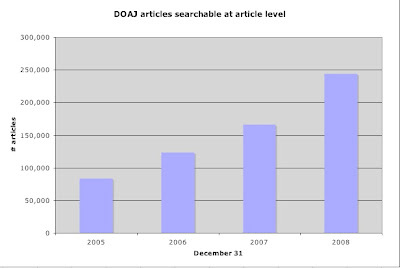 This illustrates not only a healthy and growth DOAJ title growth rate, but an even more impressive rate of growth of journals providing article-level searching, and the articles obtainable through a DOAJ search. Either of these Google spreadsheets can be downloaded; use the Edit key at the bottom of the screen. The dataverse version will be updated at a later date due to technical issues. Update April 2: DOAJ exceeded 4,000 titles on April 1, and has issued a major announcement on Long-Term Preservation of Open Access Journals. The PubMedCentral journal list has been updated with additional information - the April 2, 2009 PMC title list is available here. Thanks to Peter Suber on Open Access News. New YouTube Channel, just for higher ed videos! Thanks, You Tube - Chronicle of Higher Education - and Open Access News. 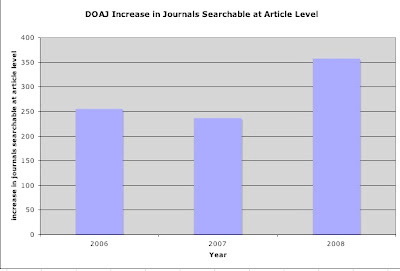 The following charts illustrate the Dramatic Growth of the Directory of Open Access Journals (DOAJ) over the past few years. 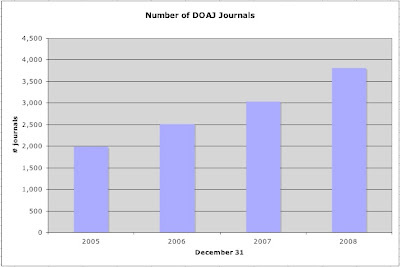 In brief, from December 31, 2005 to December 31, 2008, the number of titles in DOAJ jumped from just under 2,000 to over 3,800 (almost doubled in 3 years). The increase in searchable content is even more remarkable, though! The number of journals searchable at article level more than doubled, from under 500 to over 1,300. The number of articles retrievable through these journals tripled, from about 80,000 to about 240,000. 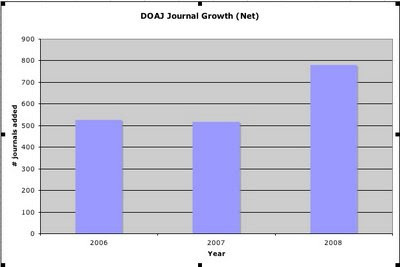 Plus, as the following charts illustrate, not only did DOAJ grow dramatically from 2005 - 2008; the growth rate also grew dramatically, by every measure examined. On Wednesday, March 18, MIT adopted a university-wide OA mandate. For the full text, see Open Access News. This is important, because it is the second university-wide mandate in the U.S., after Boston University, and the first U.S, university-wide mandate adopted unanimously by faculty themselves. It iis a strong mandate, and a great role model for anyone considering an open access policy. Taylor & Francis: free, free, free? 3 of the 4 items prominent on the Taylor & Francis website as of today focus on free: Free online access, Free articles, Free alerting service. None of this "free" stuff has anything to do with open access, of course - this is free samples or metadata designed to attract subscribers. But does it suggest a company struggling to position itself for a future where information is free? If so, this may be a good sign for the future of T & F. What next? My advice: work on your iOpenAccess program to make it a real open access program, and work with libraries on combined iOpenAccess / subscription deals. Was just browsing DOAJ Canada and noticed that all 4 research universities in Alberta (University of Alberta, University of Calgary, University of Lethbridge, and Athabasca University) are publishing open access journals! Athabasca University is the early leader as the world's first university all-open-access publisher. Is Alberta the first jurisdiction to have OA publishing services available at every research university? IJPE readers - a meta post-about-this blogging bit, possibly of interest: this snippet is an aside from research that I am doing for a distance presentation for Danielle Dennie's science librarianship class at McGill University later this month. The full presentation will be self-archived in E-LIS and other venues when done. This particular observation is not directly relevant to this particular presentation, so what I am doing here is openly sharing this observation on-the-fly. I might eventually include this in a formal publication or presentation - or then again, it might never fit. This is one of the reasons why blogs like IJPE should be considered scholarly blogs - and libraries should be preserving them. Growing Canadian membership in DOAJ! The list of Canadian members of the Directory of Open Access Journals is growing! As of today, there are 7 Canadian individual library members, 1 Canadian library consortium, and at least 1 individual member that I know of. Consortial member: OCUL - Ontario Council of University Libraries. For in-depth reasons on why libraries should become DOAJ members, see my article in the January 2008 Charleston Advisor. 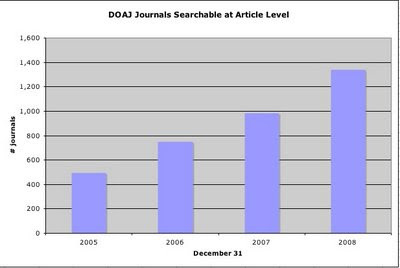 Update: since this article was written in 2007, DOAJ has increased by more than one thousand journals; more many journals are searchable at article level, and new features such as journal lists by country have been added. Another way to calculate the value of DOAJ membership for your library: analyze the costs of dealing with suggestions from faculty, students, and librarians to add these high-quality open access journals to your collection. If you have your own title list, you can figure out how much work it is to do this on your own. If you don't have a way of handling these suggestions, there is still a cost involved. These queries must be addressed; if you have no way of including these journals in your title lists, reference librarians will be looking them up, over and over, one at a time. DOAJ membership is definitely an Essential Efficiency in these troubled economic times. As of March 10, 2009, the journals listed in the Directory of Open Access Journals are published in 97 different countries! So far in 2009, 30 journals have been added to the top-producing country, the U.S. This is about one new U.S. OA journal every other day! This is just the U.S. - only a fraction of the ongoing Dramatic Growth of Open Access! These data are from the DOAJ's Journals by Country feature. For details on the Canadian Cancer Society Research Institute Policy, see Jim Till's post on Be Openly Accessible or Be Obscure. From the Canadian Association of Research Libraries' E-Lerts: the Canadian Research Knowledge Network (CKRN) is proceeding with an "expression of interest" to gauge support for becoming the Canadian focal point for SCOAP3. SCOAP3 is a consortium in high-energy physics aiming to transform HEP publishing as a whole from subscriptions to open access. Canadian librarians, make sure your library expresses interest! !